Above is a screen shot of from the University of New Mexico's virtual astronomy lab. Copyright © 2001, University of New Mexico & Gillingham Studios of Albuquerque New Mexico. "If we could get everything from books, we wouldn't need any teachers." "Oh, but we would my friend. Where is the human element in your reasoning? It requires a good teacher to breathe life into the words of a book. Breath and life that could never be drawn from the written pages of the book alone. Read a good book yourself, and then ask a good storyteller to read the same book to you. A world of difference...I do agree with you that a book is a great source of knowledge, but without a good teacher it is like a meal without condiments." 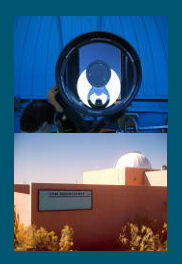 At left and right are images of the Campus Observatory at UNM and its telescope. The instrument is a Meade 14" LX200GPS acquired in 2004. The facility is open to the public as well as UNM students free of charge. Images courtesy UNM Physics and Astronomy Department Web Site and Yahoo Travel. 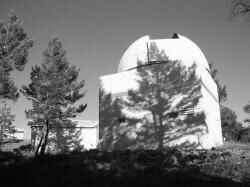 UNM also operates the observatory at Capilla Peak, "...a research facility owned and operated by the Institute for Astrophysics at the University of New Mexico. Our 61cm (24") Boller & Chivens Cassegrain is available for use primarily by the staff, students and faculty at UNM. Although the observatory is now rarely available to non-UNM research groups, proposals for collaboration with Physics and Astronomy Department faculty are welcome." Capilla Peak Observatory and the Institute for Astrophysics. Image right from Wikipedia. Q: Is it correct that the Astronomy 101L lab was created in 2001? A: The HTML version of Astronomy 101L was started around 1995. Dr. Neb Duric and a dedicated troupe of grad students transcribed and enhanced existing paper labs to the web. 2001 was about the time it acquired its present "look". It is of course evolving day to day. A: Yes this is an entry level class. A student should either be taking the lecture section of A101 or have taken it for credit in the past. If they can answer basic questions about the universe I will sometimes override the requirements. Q: What is the goal behind its developement? For example, public outreach, an extension of class work or study, part of online coursework or part of a distant learning program at UNM. A: Initially it was designed to take the place of an existing traditional face-to-face lab. Astronomy labs are more difficult to create than are physics labs because of the tools and instruments required as well as most classes are scheduled for daylight hours. After a stable version of the classroom lab was in place I decided to take it online for our Extended University program. New Media and Extended Learning (NMEL) at UNM did a great deal of work on the code to make it much more cross platform compatible and faster to load for our online version. While the content is similar the code is very different. Q: The project lab seems accessible to the general public in most respects excepting the lab tests. Are the tests strictly for student enrollment? Q: I noticed that UNM's virtual lab also makes use of other small applets or java programs to demonstrate various astronomical principles. Are these created by yourself? Students? A: Most of these were in the public domain, created by others funded by NSF [National Science Foundation] grants and other non-private groups. Cepheids and the virtual telescope are ours. The telescope is modeled after our Capilla Peak Observatory in the Manzano Mountains. Q: Are there any future plans for expanding the virtual lab concept within the curriculum of UNM's Department of Physics and Astronomy? A: While many departments, including science and engineering, at UNM offer online classes virtual labs have not been embraced by Physics and Astronomy. Even lecture courses have shied away from online instruction. Q: Can you tell me a little about your position at UNM and your involvement within this project? A: My current title is "Teaching Lab Supervisor" I started out here 23 years ago supporting the senior physics lab. My electronics experience came to be known so the department decided to open an Electronics Workshop where I designed and built instruments for our experimentalists as well as teaching labs. This was very similar to a position I held at the University of Cape Coast in the 1970s while in the Peace Corps. After about 10 years I became involved with physics teaching labs full time. During this time the Astro 101L was created and my only connection was one of acquiring and maintaining the work stations and servers for the web page. Dr. Neb Duric left UNM for Wayne State around 2002 and somehow this all became my responsibility without a word being said. During this time I also worked on various research projects. HiRAB at LANL, LodeStar Astronomy Center in NM and the Pierre Auger Cosmic Ray Telescope in Argentina. This semester I am teaching Physics 102, the online Astro 101L a seminar and taking care of numerous other labs. Q: What has the overall response to UNM's Astronomy Lab 101L been? A: Some students love the computer format, others hate it. Judging from the end of year surveys I would say most are OK with it. The online version is the same, however many students are not disciplined enough to thrive in the online community. Q: As a learning tool, what would you like to see offered in the future regarding this or any other lab programs offered on the internet? A: There is no substitute for hands on activities in the physics labs. I have seen several virtual physics labs were students can control equipment remotely and while that has some educational benefit I feel they need to be in the lab with an instructor watching them. So a hybrid version is acceptable. The role of the computer in astronomy is vital as it is the link to all of the tremendous instruments at our disposal. Simulations can approach the real thing. The ability to present images and show students the beauty of the universe is key to them enjoying the experience. Future astronomy labs need to be as interactive as possible. Q: Are there other online programs of this nature that you find useful or recommend to the student or general user? A: There are so many free virtual sky programs that I have lost track of them. I mention to the students thay should download at least one of them and play around with it. The world is at their finger tips. With a few key strokes anyone can explore the universe and began to understand how it works. I encourage them to use the web in class to cross check their work. Thanks to the great search engines now it's even easy for me to check when they have "over used" this function. Note: As this topic is well covered by the University's virtual lab the following review will just highlight the particulars within UNM's course. When astronomers measure the distance to our moon, a planet or other object in our solar system, the data they obtain is very accurate. This is a result of the tools and technologies employed: radio, radar and laser. However, the limitations of this technology is that our solar system is the furthest extent to which the various devices are capable of being utilized. Thereafter, the distance to even the closest galaxies and stars are much too far, even for instruments that send out signals at the speed of light. So, how do we obtain accurate measurments of distant objects? How can we be sure that our instruments are precise and accurate over the millions of light years which we must measure? 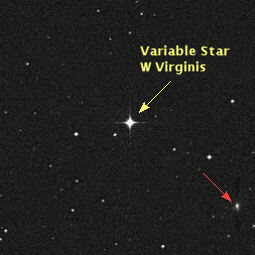 Enter the Cepheid Variable Star and UNM's Lab Course 11. 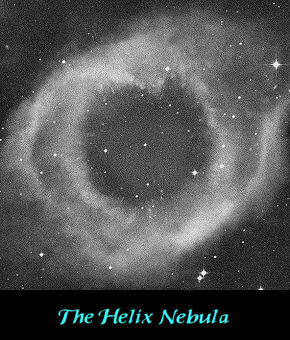 The next subject for the student is on the properties of galaxies: their shape or morphological classification as determined by the Tuning Fork Diagram originally devised by Edwin Hubble, their color (which shows the relationship between absolute magnitude, luminosity, and mass) and finally, the galaxy's size, a lesson that provides the student with one of the reasons for which the Cepheid star is used in determining stellar distances. As noted in Lab's 11 subsection on galaxies and their size, "Once the distance to a galaxy is known its actual size can be calculated from its apparent size in an image. This was first accomplished by Hubble when he used Cepheid variables to find the distances to galaxies." It is also in this section that the student is instructed to use the lab's virtual telescope in order to measure the angular size of galaxy M100. 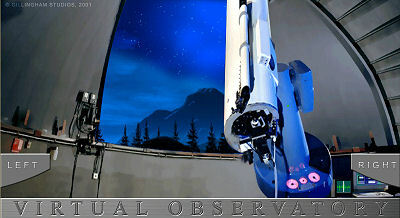 At left is a partial view of the virtual telescope which is modeled after the University's Capilla Peak Observatory. Off the image, below the telescope are blank boxes for the student to input object coordinates, in the form of Right Ascension and Declination, image size in arcminutes and options for image format type, FITS or GIF and a choice of filters to be used, Red or Blue. As a nice embellishment, the telescope can also be slewed left or right, displaying a rendered vista of a mountain area, night sky and stars. The Cepheid stars have taken on an even more important role since the Hubble Space Telescope Key Project on the extragalactic distance scale relies completely on them for the calibration of distance indicators to reach cosmologically large distances. In other words, if the calibration of the Cepheid Period-Luminosity relation were wrong, the entire extragalactic distance scale and with it, the rate of cosmic expansion and the related acceleration, as well as the estimated age of the Universe, would also be off. The research team of French and Swiss astronomers at the ESO determined that their work matched the figures obtained in an earlier project and taken together, boosted the reliabilty in astronomer's use of the Period-Luminosity relation for measuring the distance to nearby Cepheids. Also see the NASA/ESA article Youthful-looking galaxy may be an adult regarding the use of Cepheids found in the galaxy I Zwicky 18 in determinging that it was actually 10 million light-years more distant than previously believed. 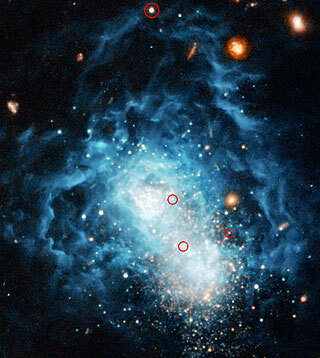 Image at right show the Cepheids found (red circles) in Galaxy I Zwicky 18. Credit NASA, ESA and A. Aloisi (European Space Agency and STSI). While all the labs in this virtual course were very well presented, one other is worth mentioning here: the Observing Project of Lab 0. This lesson is a "hands-on/eyes-on" component that requires the student to utilize UNM's campus observatory, the telescope and building's dome which are shown at left. This is a points-based lesson that requires the student to choose several of 18 listed projects or to devise one of their own. The student needs to accumlate a total of twenty points, with the various tasks worth five or ten points each. The lesson is designed to allow a student to complete this section in a single nights' observering or, if one of the ten-point projects is chosen, over several observing sessions. 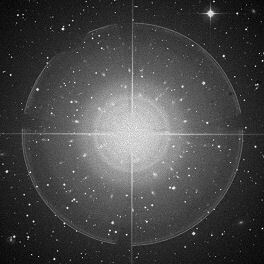 The option of stellar objects requiring the use of UNM's campus telescope ranges from observing Open Star Clusters and the Surface of the Moon to Emission or Reflection Nebulae and the Rotation of Jupiter. Fans of Tycho Brahe, as well as those who find pleasure in sketching, will enjoy the other option of being able to choose assignments in naked eye observations as well, from the Twinkling of Stars, Minima of ALGOL to the Seasonal Changes in Constellations. As a final note to those who like to relax by drawing or sketching, the Twinkling of the Stars and Phases of the Moon assignments are a particularly enjoyable way to earn points within this lab's lesson. Sketching and drawing are not only a common practice within astronomy that is very much in evidence today (see: Astrophotography and Sketching at the cloudynights website) but one of the oldest recognized research tools within the astronomical community as well as the oldest aspect of astronomy, with roots going back as far as the prehistoric age of 15,000 B.C.E. (see: History - Prehistoric Astronomy, a Griffith Observatory Star Award website). The University of New Mexico, Department of Physics and Astronomy's Virtual Lab 101L is a wonderful implementation of an educational tool, not only as a learning resource but one in which many students are able to experience a small sampling of the world of astronomy up close and personal. It is in this sense that the virtual program is of the greatest use and help to the modern educator: reaching out to the many in a field in which the limits of the instructor are often determined by matters of funding and the availibilty of expensive and precision instruments of science like the telescope and the amount of time one has in order to employ them for their use; at least in the field of astronomy where most classroom activity occurs during daylight hours. With that in mind, UNM's virtual lab has created for the student of science a learning tool that is helpful, educational, provocative and interesting. It has accomplished this through the creation of an online program of informitive text, images, virtual applications, like the program's telescope and use of interactive applets, all of which has been created by the University as well as others in the quest to impart a lifetime and more of scientific knowledge and experience to the student. The virtual lab is both a valuable asset as well as a useful resource that will hopefully continue to grow and expand within the curriculum of the University of New Mexico's Department of Physics and Astronomy as well as other institutions of learning. At left is seen the complex and inscrutable Helix Planetary Nebula (NGC 7293), the image was obtained from Astronomy 101L's virtual observatory telescope. The nebula is located a mere seven hundred light years from Earth in the constellation Aquarius. As I finished writing this Site of the Month publication, I found my thoughts far afield from where I had started, insofar as online virtual education is concerned. The research for this project has taken me through numerous private and institutional web sites as well as blogs and page commentaries dealing with the practicality and usefulness of "online virtual education". I began by regarding the concept of virtual education as a whole component within the realm of teaching and learning; one and the same. If we take virtual education to mean instruction in a learning environment where teacher and student are separated then this is not a good thing in the pure sense of the word virtual. Suffice it to say that in today's plugged-in and connected world, the physical separation of the student and teacher can only work where the former has gained, through human interaction, the experiences of life's responsibilities, prior educational disciplines, an inner fortitude to succeed on one's own and the "in-place" resources required for the chosen educational goal. Having taken myself through numerous halls of study and education I still find the need for an enviroment conducive of accomplisment. By way of example consider: I have taken and viewed some few images of stellar objects, first through the use of my own equipment and later, over the internet via a robotic telescope. I found the feelings of accomplishment were primarily from the results of my efforts and only recently has the difference for me become crystal clear. The path to success first required a general knowledge of astronomy (education) then the fruits of that education; of waiting for a clear sky, setting up, tuning and fine tuning the instrument and finally the moment when you look through that eyepiece and voila! In the second instance it required no educational expertise other than knowledege of the internet for the whole affair was simply click on the desired object, wait a few minutes and download the results. Admittedly, their image was much better than mine (and there is absolutely nothing wrong with robotic telescopes as they are an excellent resource and tool); however, it lacked a certain feeling of accomplishment and therein lies the point. There is no subsitute for a hands-on education in an envrioment complete with our peers and betters, for there is much more than the resources needed and the instructions to use them at work in our education; there is an unspoken reliance on others to teach us the wisdom of how to use our accquired knowledge in order to promote within us the feelings of self-worth that only derive from the accomplishments within our lifetimes.  Nek Aleknipov, unknown neo-Russian philospher and amature astronomer. Postman, Neil THE END OF EDUCATION: Redefining the Value of School, Knopf, New York, 1996 produced by Elizabeth Murphy, Fall 1996. Salamon, András Estimated number of users of the Internet Internet Statistics based on estimates from Nuasoft Web Services which are updated monthly. Wikipedia Kepler's laws of planetary motion, above image has been used under the provisions of the Creative Commons Attribution ShareAlike 3.0 as provided by the images' author and creator. Bryant, Walter W. KEPLER published 1920. Pioneers of Progress, Men of Science Edited by S. Chapman, M.A., D.Sc., F.R.S. Online text produced by Clare Boothby, Ben Beasley and PG Distributed Proofreaders. J. D. FERNIE AND P. EHLERS USING BV PHOTOMETRY TO DISTINGUISH BETWEEN TYPE I AND TYPE II CEPHEIDS The Astronomical Journal, 117:1563-1567, 1999 March Received 1998 September 22; accepted 1998 November 11 © 1999. The American Astronomical Society. All rights reserved. Barnard, Edward Emerson, Mars: His Moons and His Heavens, 1880, from an unpublished manuscript by E. E. Barnard in the Vanderbilt University Archives. Johannes Kepler: The Laws of Planetary Motion Astronomy 161 website by the Department of Physics & Astronomy, University of Tennessee website. Translations of Works by Johannes Kepler, the Science of the Harmony of the World (1619), translated by Christopher White with the assistance of Sylvia Brewda The Schiller Institute, 2001. All Rights Reserved. Unless otherwise stated, all images, screen shots, lab materials including instructional, software, scripts and web pages referred to herein are copyrighted © by The University of New Mexico Department of Physics & Astronomy and Gillingham Studios of Albuquerque New Mexico  All rights reserved. None of the content herein may not be reproduced or copied in any manner from this website without the prior written permission of above indicated copyright holder(s). All images and orginal works of the author(s) used within the above or foregoing web pages are for the sole purpose of information and display at A Universe in Time website and have been used with the kind permission of the respective owner(s). Page Designed by Ken Pinkela 2009 -- .css Template by Doreen "brite_star" L.